Sunday School goes on a journey of discovery about Guatemala with Gary MacDonald. On Sunday the children were invited to see, hear and touch stories about Guatemala. These were offered through photos of community life, materials (friendship bracelets) and hearing about some of Gary’s experiences in Guatemala. 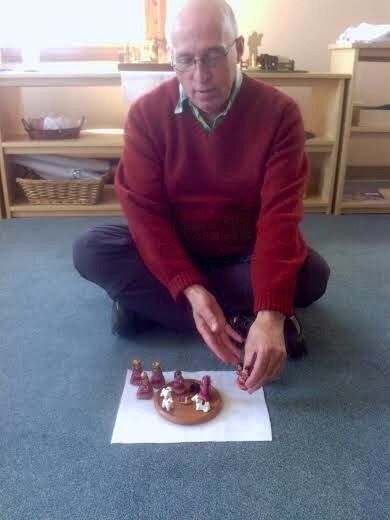 This tiny nativity set is a gift from Guatemala which Gary brought back for the children. It is made from clay in Guatemala. 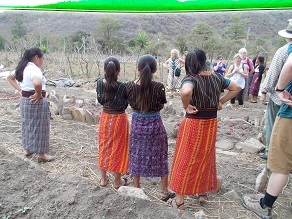 The figures are dressed in colourful traditional cloth made in Guatemala. muchas gracias, Gary! Gary has been to Guatemala with a group “Breaking the Silence”. This (BTS) is a voluntary network of people in the Maritimes who began to organize in 1988 to support the efforts of Guatemalans struggling for political, social, and economic justice. Did you know that Mayan people can be identified by the unique design of their clothing? You can ask Gary about his experiences over a cup of coffee at Sackville United. Fair Trade coffee also supports the work of Breaking the Silence. You can buy coffee and chocolate in the Office.